The future of secondary school education provision in Sandown was being discussed today (June 20) as Bob Seely, the Conservative MP for the Isle of Wight met with Hampshire education officials and Isle of Wight councillors in Westminster. This comes after Academies Enterprise Trust (AET) launched a consultation. 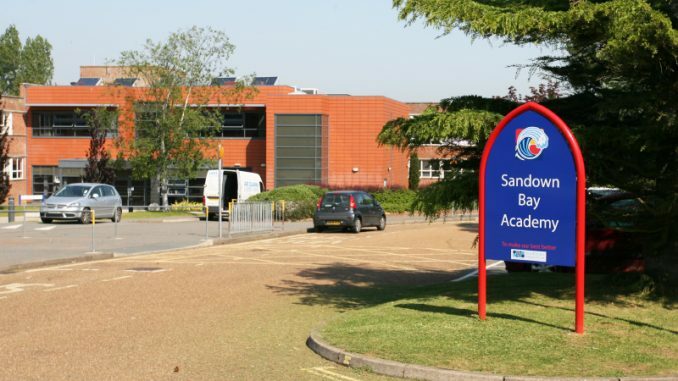 The trust is planning to merge Ryde Academy and Sandown Bay Academy, it’s two schools on the Island. The group met with the Schools Minister, Lord John Nash, at the Dept. of Education and also the National Schools Commissioner, David Carter. South London and South East’s School Regional Commissioner, Dominic Herrington. At the conclusion of the meeting, the MP stated that they had made a strong case for why Sandown needed its own secondary school and that they had also explained the plans that were in store to put up a single school that would go from 4 – 16 and this would start with The Bay CE Primary School. He added that the minister had listened keenly to what they had to say and had responded with some challenging questions but also made it clear that no decisions would be made until the public consultation was carried out and results revealed. He then went on to thank Brian Pope and Councillor Chris Whitehouse for their work. Councillor Paul Brading, the Cabinet member for Children’s Services was present at the meeting and he stated they were able to assure Lord Nash that apart from 2%, everyone else who had attended the consultations at that point in time had been for the plan to give Sandown its own secondary school and that many people were not satisfied with AET’s running of the Sundown Bay Academy. He, however, added that at the moment, it was important for more students, parents and members of the community to give their views on the consultation so that the minister could see that the people were together on this issue. Students will need to travel for six miles to get to school in Ryde or nine miles if they were heading to Newport in case the plans to shut down the secondary school in Sandown in September 2018 go ahead. Seely finished by stating that by the time they were leaving they had left the Minister with no doubt that shutting down the secondary school in Sandown was going to result in unreasonably long journeys for students and would cost an extra million pounds to bus the children around.